The AMK Foundation/BIO-WEST, Inc. Adaptive Center for Common Ground Outdoor Adventures opened December 2017. This brand new facility is located slope-side at Beaver Mountain Ski Area offering year round access to the beautiful area. 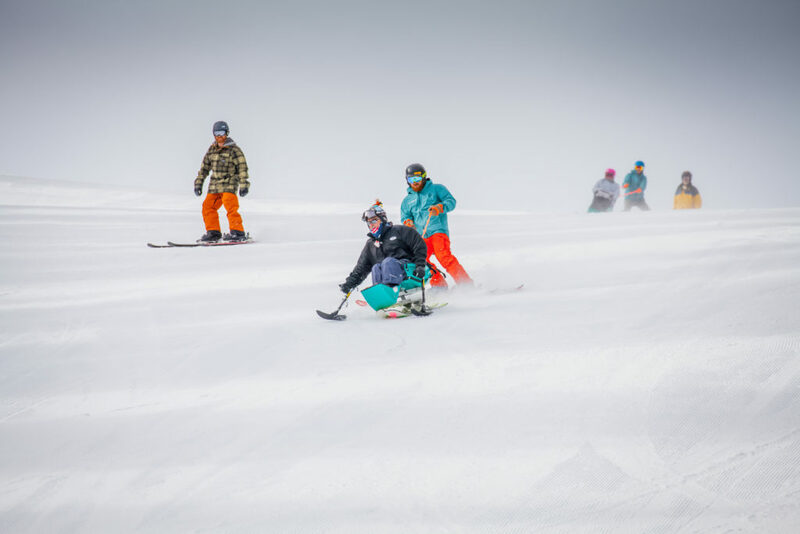 Ski and snow board lessons for ALL abilities occur on a daily basis. The facility is equipped with a climbing wall and offers a variety of activities with something for everyone, including cycling, hiking, canoeing, and more! Calling all skiers and snowboarders! Our new adaptive center at Beaver Mountain is open for ski and snowboard lessons 7 days a week from late December to the end of March. Curious about the different types of skiing? Two-Track Skiing: Two-track skiing is for any athlete who can stand under their own power. It resembles traditional skiing. However, these skiers may still need aids such as tethers with guides. 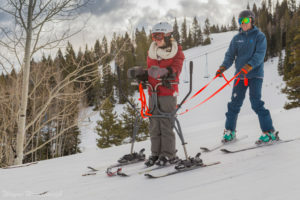 Two-track skiing is best for adaptive athletes with developmental or cognitive disabilities, visual or hearing impairments, mild cerebral palsy, autism, or traumatic brain injuries. 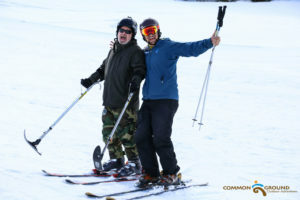 Visual and Hearing Impairments: It has to be noted that anyone can enjoy the slopes. 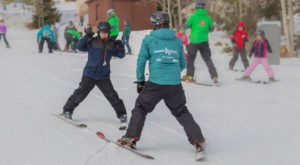 Visually impaired (VI) athletes ski with guides who use a combination of verbal commands and signals to help the athlete navigate the snow. Hearing impaired athletes use visual clues and sign language to hit the slopes. Three-Track Skiing: This type of skiing is unique in that the athlete stands up one one skiing while using outriggers in each hand to assist with balance. Three track skiing requires plenty of strength in the leg and arms, so athletes with weaker limbs may want to consider another option. Typically, this style of skiing is suitable for those with above the knee amputations. Four-Track Skiing: In this adaptation, the athlete stands on his own two skis while also using outriggers, having four points of contact with the snow. This style of skiing is great for a variety of disabilities, as long as the athlete can stand on two legs. Ski Legs/Slider: A form of four tracking with a “walker on skis.” This device is a Fram with trunk and forearm support. It is adjustable for height and width along the ski angle. It works well for someone who wants to stand up ski, but needs more support than outriggers. Bi-Ski: A Bi-Ski has a bucket seat attached to a frame, and can load and unload from the chairlift. There are two skis under the frame, which offers more stability than one ski. 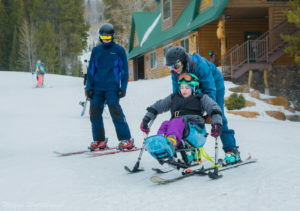 Typically, there is an instructor on tethers to help the adaptive athletes steer down the mountain. A bi-skier can use either outriggers that are fixed on the frame, or hand-held. A bi-ski is frequently used by athletes who are new to the sit ski world, before moving on to a mono-ski. Additionally, bi-skis are great for disabilities that affect mobility. Mono-Ski: This style of skiing uses a bucket seat attached to one ski underneath. The athlete uses two handheld outriggers for support. A mono-ski requires a strong core or chest and upper body, and can be difficult to learn. Most commonly, the mono-ski is great for individuals with certain spinal cord injuries or with lower limb amputations, but it can be a good fit for those with multiple sclerosis, muscular dystrophy, and cerebral palsy.